Need a free media player to play videos, audios, DVDs and other media files? Here's the best for you. Both Windows and Mac computers are accompanied by default media players. Windows users can rely on Windows Media Player, while Mac owners have QuickTime Player. Nevertheless, for some reason or other there are still a large number of people looking for third-party best media players. Perhaps it is because they don't like the interface and layout of default player. Maybe because the player is not easy to deal with. And the most common cause is that the limited file types supported by default media player can not satisfy their needs. Default media player is not enough for you, and you yearn for a better option? Just keep reading, because we've made a list of top 5 best media players for Windows, Mac and other operating systems. Most importantly, all of them are free. Hope you can find a nice media player after reading the reviews below based on supported OS, supported multimedia file types, user interface, usability, features and more. 5KPlayer is a new fast-emerging media player. New comer as it is, it can stand up to the competition of best media player due to many reasons. It is lightweight and clean. After launching this player, the first thing to catch your sight is the straightforward, modern and self-explaining interface and layout. You know what media files it can play right away while looking at the main window. It can play video media files in MKV, MP4, AVI, FLV, HEVC, AVCHD, M2TS, MOD and all video formats with 8K/5K/4K UHD/1080P HD/SD quality, audio music media files in MP3, AAC, M4A, APE, FLAC and other audio formats, as well as regular and copy-protected DVD discs, ISO files and DVD folders. It comes with all useful setting options you may need, like rotate, video tuner, deinterlace, equalizer style, create playlist, select audio/subtitle track, and so on. Moreover, it keeps updating to meet users' new needs, for example, play video media files on new Windows 10. 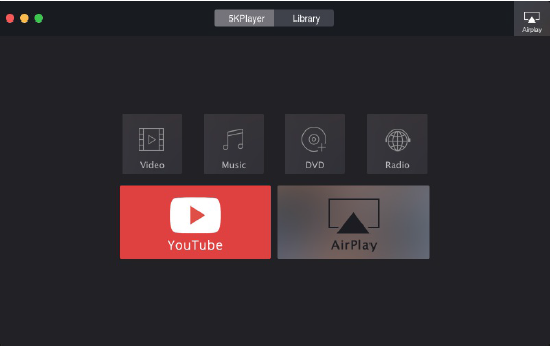 Bonus features: work as a radio player; free download videos from YouTube and 300+ sites; support streaming video audio media files among multiple platforms using built-in AirPlay feature; convert media files to MP3, AAC and MP4. VLC Media Player is a well-known multimedia player, and also always been acclaimed as the best open source media player. It can play most video audio media files without codec packs installed, DVDs, Audio CDs and VCDs. Like 5KPlayer, it isn't bundled with any spyware, malware, viruses and ads. It is also packed with many settings options, more than 5KPlayer. But in most cases, you may think they are redundant. Bonus feature: do media conversion and streaming. GOM is also a free media player with high visibility. With the pre-downloaded codecs, you can play all popular video audio media file types without additional codec packs. If you throw an uncommon file to it, its codec finder will help find sufficient codecs online. Another advantage is it has the potential to play damaged or partially downloaded files. Additionally, GOM Media Player official site offers multiple skins for download to customize your media player. However, it is ad-supported. Here we come to the fourth best media player – KMPlayer. As powerful as the abovementioned, KMPlayer can play stacks of media files, including 4K/2K/3D video medias, audio files as well as DVDs. You can freely set up your libraries to achieve better media playback experience. And It is also worth highlighting that it is able to adjust the playback screen with respect to your screen. KMPlayer is definitely a powerful free media player, but it is also ad-supported. The final member of best 5 media players falls on SMPlayer. This top free media player comes with built-in codecs to ensure you play video audio media files without downloading external codecs. Superior to other best media players, it can remember the settings of all files you play. What's more, it is available to download subtitles for movies, provides a couple of skins to satisfy your aesthetic, and offers more than 30 languages to enable you to use it in your own language. Bonus feature: Apart from playing local media files, it can also play YouTube videos. All of them are top-notch free media players out there. And all of them have the features they are proud of. Just free download a media player according to your own needs. Don't hesitate to give these best free media players a chance - you will have nothing to lose. If you want to play 4K UHD/1080P/720P HD video/movie media files with minimal demands on your system resources, 5KPlayer is worth a try. Furthermore, it outputs high video audio quality. Don't worry OS compatibility problem. This up-to-date best media player can work well on new Windows 10 and macOS High Sierra. 100% free and clean.